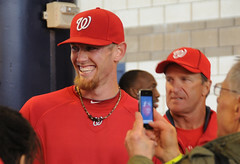 stephen strasburg | Let Teddy Win! 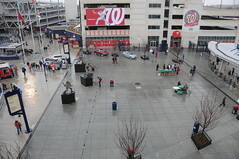 A steady afternoon rain and temperatures in the 40s put a damper on the first-ever springtime NatsFest on Wednesday at Nationals Park, as many of the planned outdoor activities were moved, postponed, or canceled altogether. 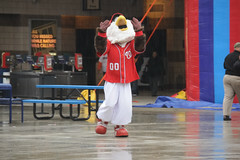 but the field remained covered for most of the day, leaving Nationals mascot Screech to pray for the sun to come out, and fans to wait until evening for meet-and-greet opportunities. Fans were still invited to enter a raffle for a chance to race against the GEICO racing presidents, but the announcement of the winners was postponed, as was the race itself. 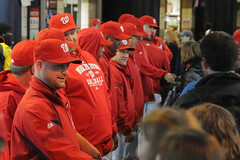 The forecast calls for a 70% chance of rain for Thursday’s season opener at Nationals Park. A team spokesman said that they would consider moving the game to Friday afternoon, but will not make that call until Thursday morning. 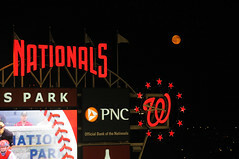 The beautiful bright moon that hovered over the Nationals Park scoreboard wasn’t officially full, but what other explanation could there be for the 4 1/2-hour spectacle that unfolded Thursday night. The night that had it all started with an awesome display by one young superstar-to-be and ended with a burst bubble about another. In between, the game that saw 43 players pound out 30 hits over 13 innings was overflowing with personal drama. 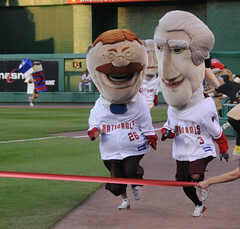 As if on queue, the Nationals racing presidents were prepared to match the drama step by step with a few oddities and milestones of their own. In his 4th appearance this season, Teddy Roosevelt’s longtime nemesis “That Cat” appeared along the first baseline, dancing about in front of the stands during the 4th-inning presidents race. Teddy jumped out to a big lead in the race, but when he spotted the panther, he veered off course to pummel him into the stands. Thomas Jefferson took the tape. As the game advanced into the night and the crowd thinned, the Bull Moose took to the stands to entertain the crowd. 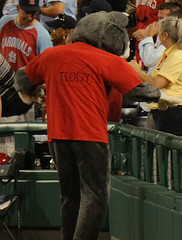 In the 12th inning, Teddy parked in centerfield section 101, posing for photos with fans. When he was still there at the top of the 13th, we knew trouble was in store. a second official race of the night. Apparently Teddy didn’t get the memo. When Washington, Jefferson, and Lincoln burst out of the centerfield starting gate, Teddy was still hanging out with fans in the stands. He jumped up from his seat and raced around the concourse, but didn’t make it to the field in time to compete. presidents race tie to Tom and Abe. Here are two great videos courtesy of YouTube member lfahome, including a great capture of Teddy’s encounter with That Cat! 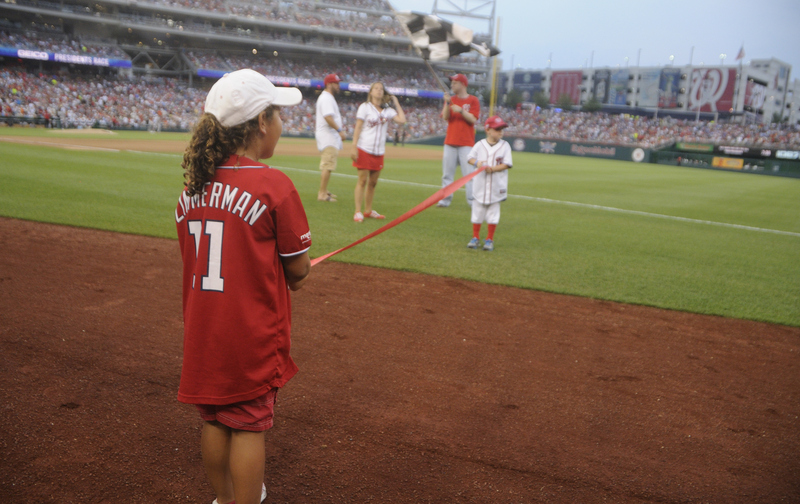 The Washington Nationals have released a coupon code “for Teddy’s fans” for this week’s series vs. the Florida Marlins, including Tuesday night’s much-anticipated return of Stephen Strasburg to the Nationals Park mound. The code gets you half-price tickets in the outfield corners ($17), outfield mezzanine ($14), and upper infield gallery ($8). You must order at Nationals.com using Coupon Code “TEDDY”. As always, 400 Grandstand-level seats (Section 401/402) will be available for $5.00 each at the gate before the game. No coupon required. 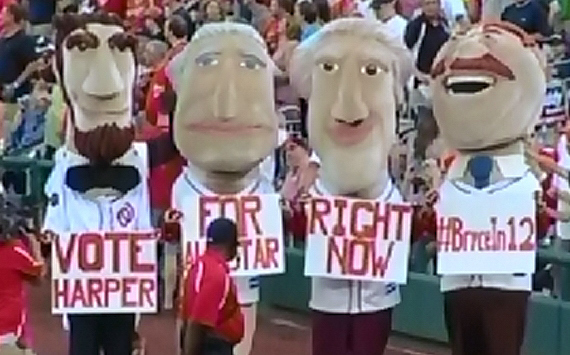 It’s safe to say that the Washington Nationals presidents race was not the main event Tuesday at Nationals Park. The mood was absolutely electric as 40,315 came to witness the major league debut of Stephen Strasburg, and despite hype and expectations that seemed impossible to meet, the rookie managed to exceed them, posting one of the greatest pitching debuts in major league history. Expectations were high for Teddy Roosevelt as well, as many in the crowd expressed their hope that the Bull Moose would do his part to help mark the dawn of a new Nationals era with a 4th-inning victory. 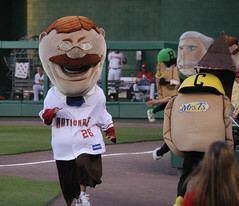 The Nationals pulled out all the stops when the race began, as the “Un-racing sausages” (the Nationals’ parodies of Milwaukee’s famous racing mascots) jumped out of the gate to start the presidents race. The four presidents followed, tailed by Pittsburgh’s own racing pierogies, and a couple of secret service agents on Segways, creating a very crowded field. Thomas Jefferson and Teddy Roosevelt broke away from the crowded pack early, along with racing sausage Choriz-No. Then Teddy put on a burst of speed, sending the packed house into a frenzy. That’s when pierogie Cheese Chester appeared along the first base line. 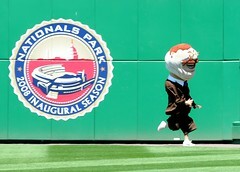 It was a familiar site to presidents race fans, and a Teddy ambush looked inevitable. Chester took a running start as the racers entered the home stretch, but instead of tackling Teddy, Chester ran between the two presidents and put a full-on body slam on Choriz-no. 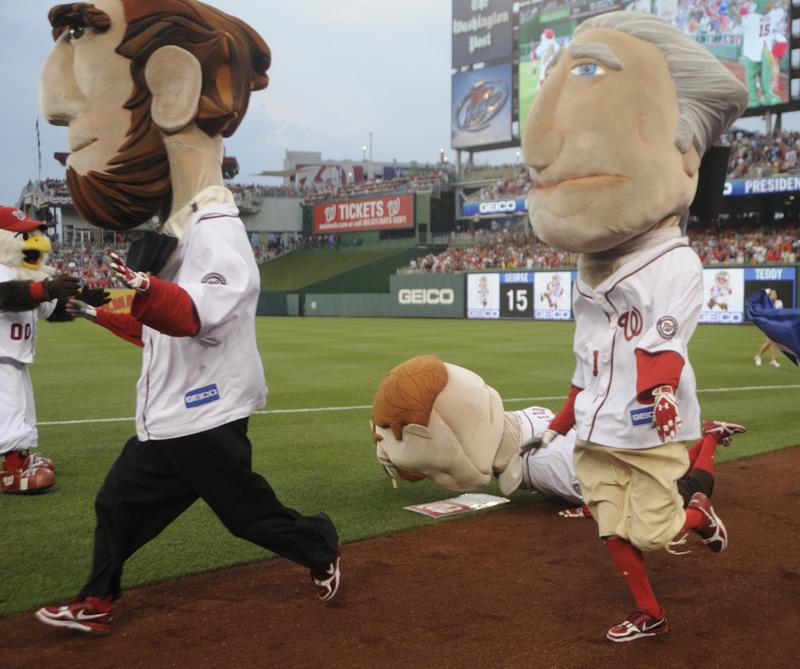 That left nothing but daylight between Teddy and his first-ever presidents race victory; but in a race to the finish, Teddy ran out of steam, and Thomas Jefferson passed him on the inside to capture the win. As Tom celebrated, and boos rained down from the sellout crowd, Teddy could do nothing but bend over in shame. As the hype for pitcher Stephen Strasburg’s debut reaches a fever pitch, with media coverage rivaling a league championship series, the Washington Nationals are releasing additional $10 standing room only tickets via the stadium box office this afternoon, ensuring an all-time Nationals Park attendance record will be set tonight. 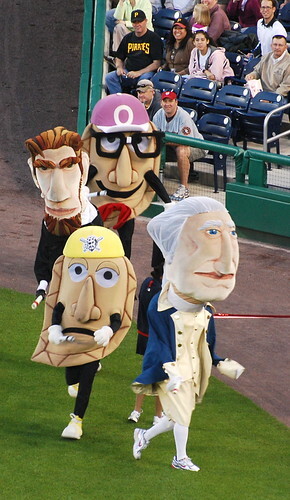 With the stands overflowing and the auxiliary press box bursting at the seams, the Nats have still found room to invite a handful of additional non-paying guests — Pittsburgh’s Racing Pierogies — who will no-doubt make an appearance during the 4th-inning presidents race for the 3-game homestand. 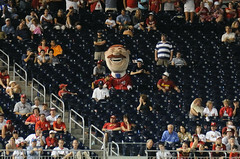 A pierogies appearance at Nationals Park was not a foregone conclusion given what happened on their last trip to DC. 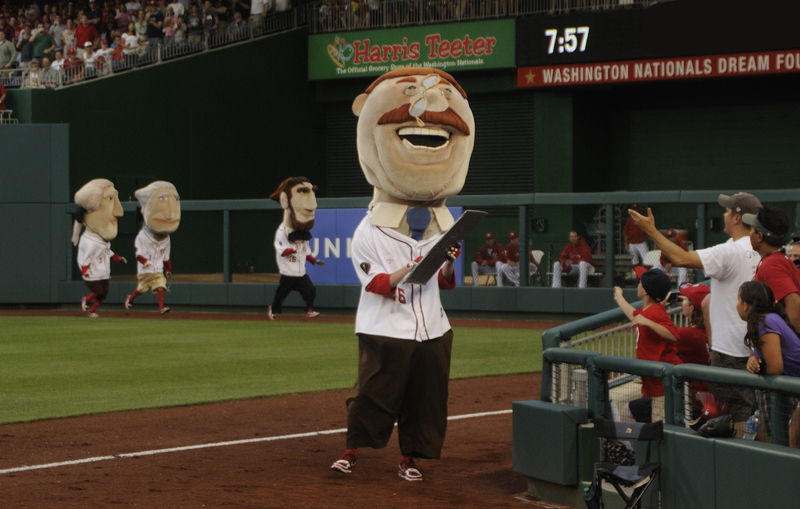 Just one year ago, in the series finale, the Pittsburgh mascots apparently went off-script, tricking the presidents and winning a race at Nationals Park, the only time no president was declared a winner. 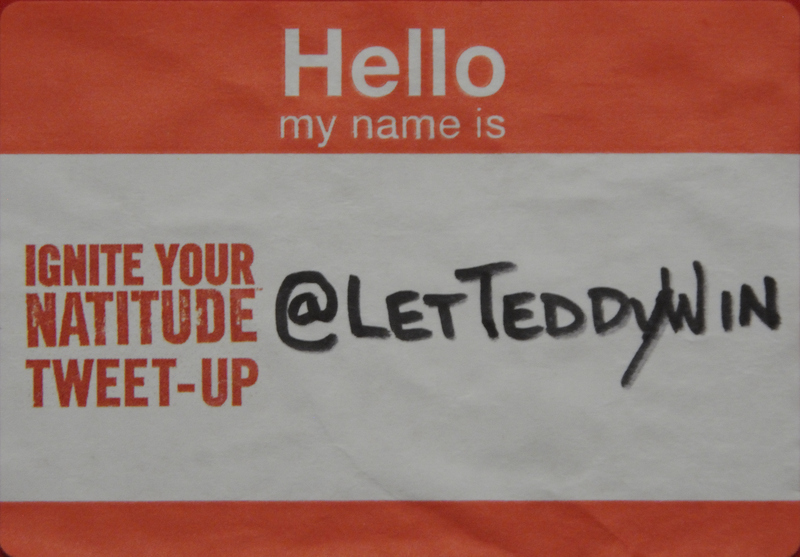 Some have speculated that tonight could be Teddy’s big night. In an evening sure to be filled with memorable highlights, let’s hope the Pierogies don’t play the spoiler. 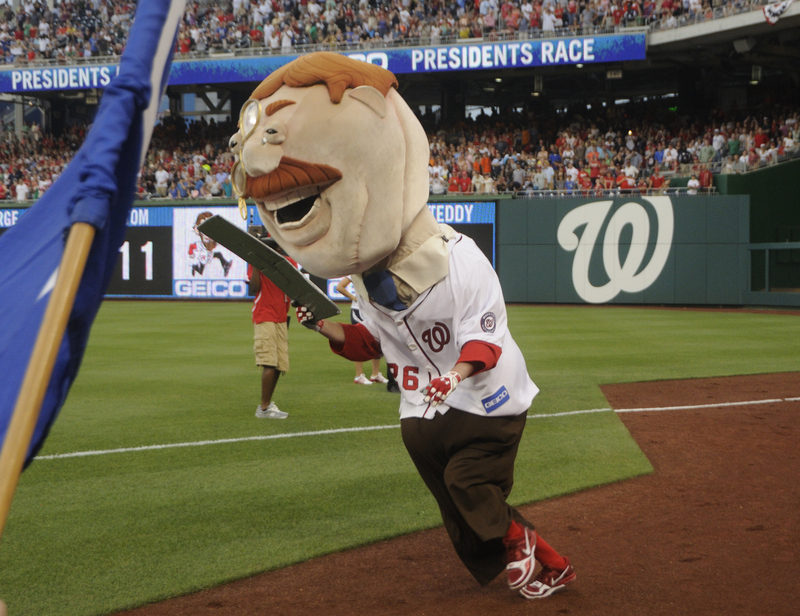 Will the Nationals Let Teddy Win on Strasmas Day? DC sports fans are gearing up for the most hyped debut in Washington sports history, as fans have dubbed Tuesday Strasmas Day in anticipation of the major league debut of pitcher Stephen Strasburg, aka Baseball Jeezus. With the team expected to choose hitting phenom Bryce Harper today with the #1 pick in baseball’s amateur draft, Nats fans see this week as a symbolic turning point in the short history of the franchise. The Nationals are surely eager to send the message that a new era has arrived. With a record sellout crowd expected, and every major national media outlet on hand, what better opportunity could the Nats have to let Teddy win? It seems a wise move, both to send a signal to the fans, and to avoid risking a chorus of 41,000 boos during their moment in the spotlight. Here’s hoping history is made on the warning track as well as the pitcher’s mound. One character who clearly hopes to prevent it is Abe Lincoln. The all-time presidents race victory leader has set aside his dirty tricks and gone on a tear, earning his 5th consecutive come-from-behind victory Sunday at Nationals Park. Teddy’s eyeglasses fell off his nose, but he gutted it out and finished the race blind. We’re hoping he manages to get them fixed on his off day today. 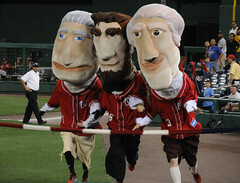 The racing presidents were sporting their traditional period garb for just the second time this season.